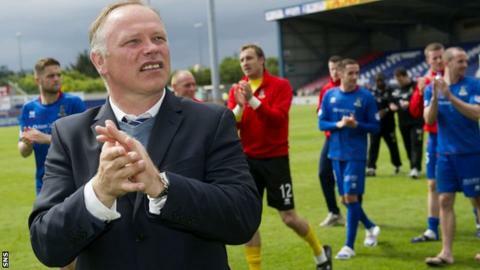 Inverness manager John Hughes says finishing fifth in the Premiership has set the benchmark for his first full season in charge next term. A 2-0 home win over St Johnstone completed the Highlanders' campaign, with Ryan Christie and Greg Tansey on target. Hughes took over from Terry Butcher in December and sealed a second successive top-six finish for Inverness. "We've got a target on our back for next year but bring it on," he said. "We'll come out ready to go next year. If we stand still then we'll go backwards. We need to keep driving forward." After an indifferent first half, Hughes' side dominated the second period and Christie headed home before Tansey's late strike made sure of the points. "It was important that we won," Hughes told BBC Radio Scotland. "The first half was too slow, it was like an end-of-season or pre-season game. We needed to up the tempo. "We were better second half and I felt that we deserved to win the game with our second-half performance." And, of youngster Christie, Hughes added: "We'll keep his feet firmly on the ground. "He's one that's certainly got a bright, bright future. "He's a lovely footballer and the players in the dressing room have really taken him on board, adopted him. They'll keep him grounded. "Hopefully he's still here for a number of years, plying his trade up here in Inverness, becoming a first-team regular and scoring goals like he did today."